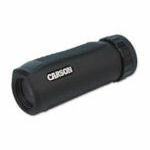 Carson Optical offers a variety of low cost monoculars with interesting features, including extreme close focus, lever focus, or golf ranging reticle. Carson Optical monoculars include five different models with varying capabilities. The golf monocular contains a rangefinder to determine distance from the pin. There are two close focus monoculars that let you focus down to 18", a quick focus monocular, and a waterproof model. All are inexpensive.